This place is located in the westernmost part of Austria, on the border with Switzerland and Liechtenstein. Feldkirch city today is known mostly for its perfectly preserved medieval architecture. Feldkirch has a unique beautiful old part, which is dominated by the castle Schattenburg, which is considered a symbol of Feldkirch. The village is situated in the province of Vorarlberg, by the Ile River, at an altitude of 458 meters. 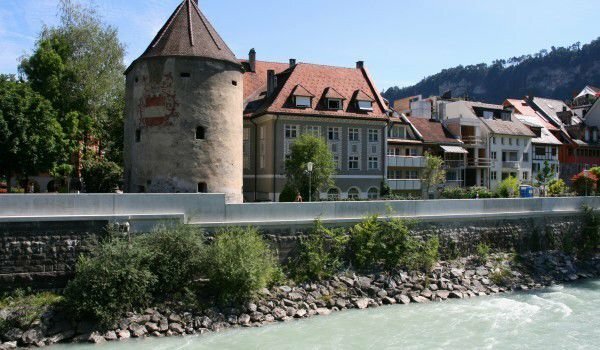 Feldkirch is located about 14 km northeast of the capital of Liechtenstein, Vaduz. Today, it has a population of about 30, 000 inhabitants. The nearest international airport is located in Innsbruck. The history of the settlement began in the early 13th century, when in 1218 Count Hugo I von Montfort built in Shatenburg an impressive castle on a high hill. The count needed a massive fortress, to ensure continuous protection at the time of raids south and east. In the following centuries, in the 13th and 14th century Shatenburg is a military fortress. From this period, today we can see the authentic guns of the castle. Entry comes against an entry ticket of 6 Euro. The museum exposition on the second floor is where you can see collections of medieval weapons, and a Roman crucifix of 1250. The whole castle is surrounded by a pleasant park, and the height of the hill there has a beautiful view of Feldkirch. Feldkirch is incredibly beautiful and picturesque city that offers its visitors many historical sights, but also no shortage of boutiques and eccentric, avant-garde street bars and cozy cafes. The historic center of Feldkirch exists from centuries ago during the Middle Ages. The main market square is surrounded by beautiful houses in ancient style and pleasant cafes. Another important landmark of Feldkirch is a medieval tower of the original fort, known as Katzenturm. This remarkable old building reaches a height of 40 meters and keeps the largest bell in the whole of Vorarlberg. The weight of the bell reaches 7500 kg. Among other attractions are the Cathedral St. Nikolaus with its stunning and colorful glass dating from the late Gothic period. Under Satenburg hill, a road tunnel was built, and as you approach by car, the sight up to the palace is truly impressive. The area of Feldkirch has excellent opportunities for hiking and outdoor activities. At one end of town is the wooded hill Ardetzenberg, which reaches a height of 631 m. At the northern end of Feldkirch is the nature reserve Wildpark with its typical alpine flora. Among the inhabitants of the park are many Marmots, ibex and wild boar.